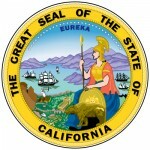 The California Articles of Incorporation of a Professional Corporation | ARTS-PC will need to be submitted to the California Secretary of State, and approved, before lawfully conducting business in the State of California. Incorporators may choose to compose their own articles, however using a state approved document comes with the benefit of having the minimum required information already set into form. Additional provisions and required documentation should be attached to this forma and submitted simultaneously to the Secretary of State. There will be a $100.00 filing fee which must also be paid at the time of filing. Once these articles have been accepted the Incorporator submitting this form will receive a copy of the submitted articles. For an additional $5.00 fee, these copies will be certified upon request. This package may be submitted by mail or in-person however, if submitting in person there will be an additional $15.00 service fee which must be paid at the time of submittal. You may mail the submittal package to Secretary of State Business Entities, P.O. Box 944260 Sacramento, CA 94244-2600 or you may drop the submittal at Secretary of State 1500 11th Street, 3rd Floor Sacramento, CA 95814. Step 1 - Enter the name of the corporation being formed on the blank space in Item 1, labeled “Corporation Name.” The name selected for your professional corporation must adhere to the rules set by the California State Board regulating the services your professional corporation renders. Step 2 - In Item 2, “Corporate Purpose,” report the profession of this corporation on the blank space provided. Step 3 - Enter the name of the registered corporate agent on the blank space in Item 3a. This will be the individual or corporation who may receive service of process on behalf of the professional corporation being formed. If the registered corporate agent has not been previously registered with this department then enter this party’s full address in Item 3b. By law this entity must be an individual of adult age or a corporation (not the one being formed) and maintain an address in the State of California. Step 4 - In Item 4, “Corporate Addresses,” enter the Street Address, City, State, and Zip Code in Item 4a. This may not be a Post Office Box. Then in Item 4b, report the Mailing Address in Item 4b if it differs from the physical street address. Step 5 - In “Shares,” report the number of shares this corporation has been authorized to issue on the space provided. Step 6 - At the bottom of the page will be enough space for one Incorporator to sign and print his/her name. If there are additional Incorporators, each one should sign an additional sheet of paper (8 1/2″ x 11 “) and attach it to this form. Step 7 – Make sure all required documents such as licenses and provisions are attached to the articles. If submitting by mail, include a payment for $100.00 (filing fee). If submitting in person then include a payment of $115.00 (filing fee + service fee). If you would like a certified copy of your articles then add $5.00 for the certification fee. All checks/money orders must be made payable to Secretary of State. 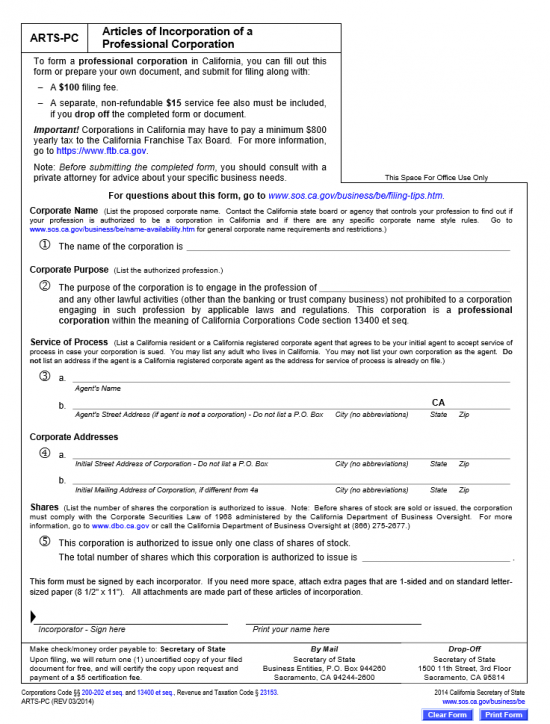 Step 8 – You must submit Form SI-200 90 days after filing the California Articles of Incorporation of a Close Corporation | ARTS-CL. You may do this by paper or electronically. If you wish to file by mail download Form SI-200 here: Statement of Information or to submit electronically go to the California Secretary of State e-file page here: https://businessfilings.sos.ca.gov/. Note: A payment of $25.00 will be required ($20.00 filing fee + $5.00 Disclosure Fee).